The rtl_433 project has support for decoding a bunch of different weather station devices. Unfortunately, it doesn't support this sharp device. It detected FSK and the right transmission length. The frequency offsets also look correct - the RTL-SDR was tuned to 917.21MHz for this test, and the frequency offsets are relative to that. But it wasn't able to get any farther than that. It would be nice if I can add support for this device to the rtl_433 project, so I'll have to come back to that. 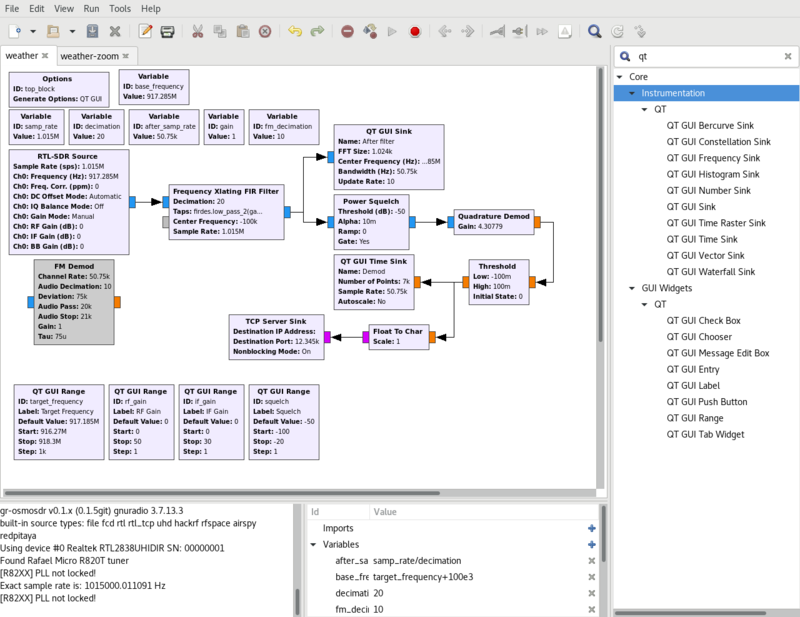 GNURadio is a handy DSP programming environment with a bunch of pre-made DSP modules you can connect together in input->output chains. I took a look at other people's GNURadio FSK decoders, and found the quadrature demod module from them. It outputs a number relative to the received frequency. When it has a signal above the center frequency it outputs a number above 0, when the signal is below the center frequency it outputs a number below 0. To set the center frequency, I used the Frequency Xlating FIR Filter before the quadrature demod block. I set the center frequency between the two transmitted frequencies. I also added the Power Squelch block to only process the signal when it was above a configured signal strength threshold. That way, the processing is idle between transmits. I added a threshold block to change the output to just 0 (low freq) and 1 (high freq). It uses hysteresis as a filter of some noise. I wrote my protocol demodulation as a second process, and connected it to GNURadio using a tcp socket. 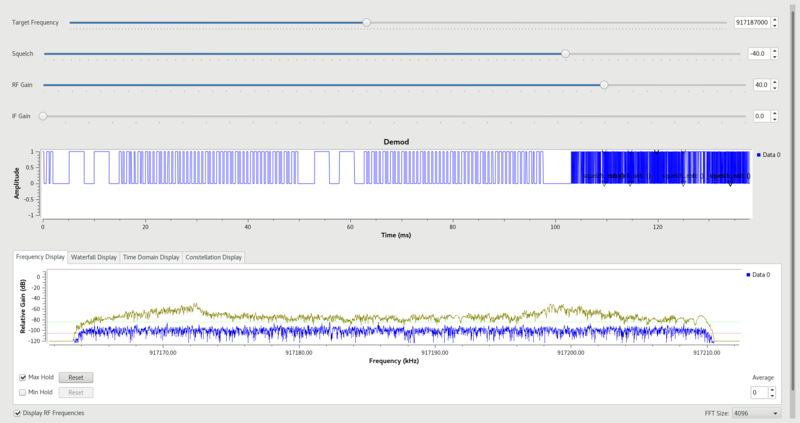 The GUI also has the ability to set the center frequency, the squelch threshold, and the RTL-SDR's gain. Below the settings, the GUI shows the last 140ms of FSK output as well as a FFT on the RF. I've turned on the max hold of the FFT to see the transmission frequencies. In the bottom FFT, you can see from the gold-colored line that the signal peaks at around 917.172MHz and 917.199MHz. You can also see that it's around 30-40dB above the current noise (in blue). I collected a bunch of these signals and compared them against what temperature and humidity the receiver station displayed. 000 - unused 3 bits? My current guess is the crc is based on a Hamming code. Hamming codes are useful because you can use it to correct single bit errors. I've made some progress in reverse engineering it, but not everything is fitting exactly as I would expect. I'll have to work more on this. Each transmission is repeated three times with the same data, so that's a useful error correction without knowing the crc.